In this remake of the 1989 movie of the same name, Dr. Louis Creed (Jason Clarke) and his wife (Amy Seimetz) move to rural Maine with their young children Gage (Hugo Lavoie) and Ellie (Jeté Laurence). 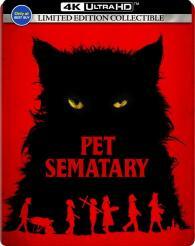 After their family cat is killed, they bury it in the mysterious local "Pet Sematary," which somehow brings the pet back to life. When tragedy once again strikes the family, Louis employs the burial ground's powers with deadly consequences. Directed by Kevin Kölsch and Dennis Widmyer. Based on the novel by Stephen King.